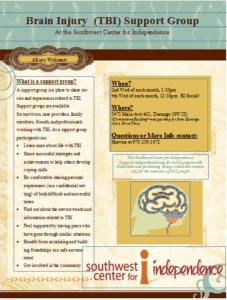 Every month members of the PTSD Support Group come together for a day of fun! Every month will be different, but always a good time with even better people. 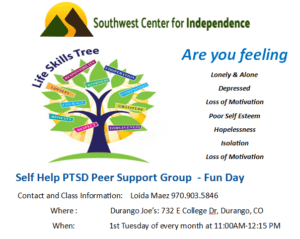 Loida will meet the group at their usual spot, Durango Joe’s, so make sure to be there! Join Shawna at the SWCI to learn about the different types of apartment complexes there are, as well as get information on the HCV voucher. 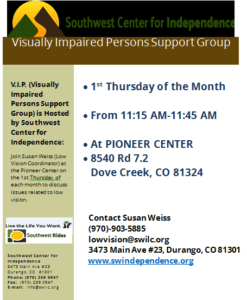 Join Susan Weiss (Low Vision Coordinator) at the Pioneer Center on the 1st Thursday of each month to discuss issues related to low vision. 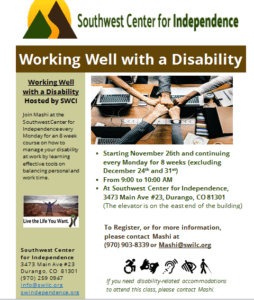 Join Mashi at the Southwest Center for Independence every Monday for an 8 week course on how to manage your disability at work by learning effective tools on balancing personal and work time. 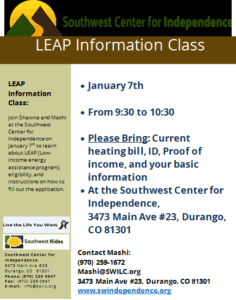 Join Shawna and Mashi at the Southwest Center for Independence on January 7th to learn about LEAP (Low-income energy assistance program), eligibility, and instructions on how to fill out the application. Things to bring: Current heating bill. ID. Proof of income. and your other basic information. 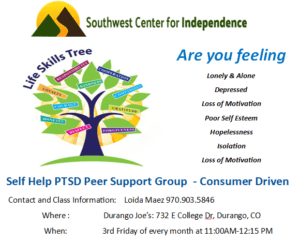 Come share a warm drink with Loida and others in the community who need a little extra support dealing with any and all symptoms of PTSD in this consumer driven support group.